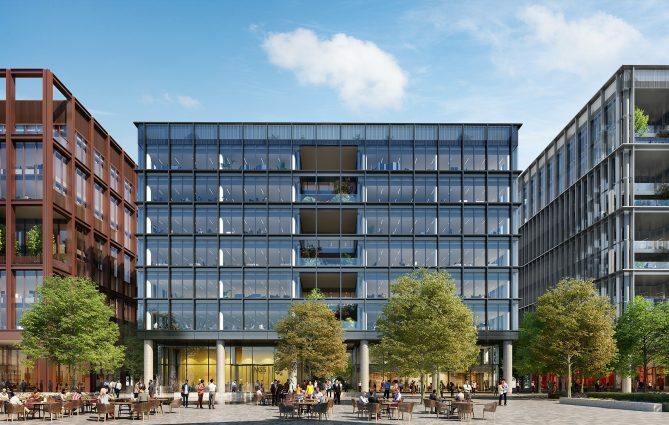 Birmingham City Council gave consent following a Reserved Matters application for the eight-storey building, forming the first phase of office development which, once completed, will provide approximately 500,000 sq ft of Grade A office space. This will sit alongside up to 400 residential apartments, 2,400 sq m of retail in the form of bars, restaurants and convenience stores and up to 900 car parking spaces. New Garden Square brings together a partnership between the progressive property and development company, Calthorpe Estates, and U+I, specialists in major mixed-use regeneration projects across the UK and Ireland. The scheme design was created by the award-winning Glenn Howells Architects. Commenting on the planners’ decision, Paul Patenall, Projects Director at U+I, said: “Today is a momentous decision for the future of Edgbaston. We are thrilled that Birmingham City Council’s planning team share our vision for New Garden Square, and are excited to see our carefully crafted plans become reality. Ralph Minott, Director of Development at Calthorpe Estates, added: “Receiving approval on our Reserved Matters application is a significant milestone in securing the future of New Garden Square and our vision to create living spaces within a dynamic mixed-use environment. As a result, we can now finalise our advanced discussions with a number of potential funding partners, with a view to progressing work on the scheme in the near future. Colliers is currently leading the search for a funding partner for the commercial phases of New Garden Square, whilst CBRE, jointly with Highgate Land and Development, are leading the residential element. When complete, New Garden Square will occupy a 10.7-acre site, west of the city centre along the Hagley Road (A456), a main arterial route into Birmingham. The site is next to the Plough and Harrow and stretches down to Five Ways, towards Francis Road and back towards Duchess Road, where the skyline now looks decidedly clear after the demolition of the first office building within the regeneration; the mid-1970s-built Edgbaston House 20 storey tower block, which was completed in late 2018. The development will be set around a new and magnificent 180m x 30m high quality public garden square, formed from a series of eclectic gardens and mature trees, fronted by the retained existing classic Grade II listed buildings along the Hagley Road.